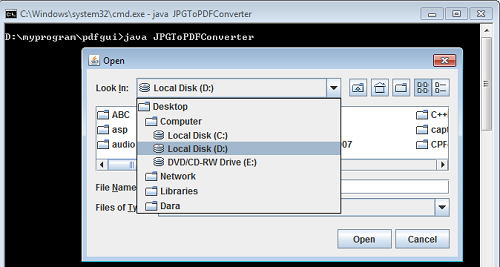 The JPGToPDFConverter program is able to convert an image to a PDF file. You can convert different image formats (e.g jpg, png, gif, bmp, ...) to PDF files. When the program runs, it allows you to select many image files as you want. Each image file is converted to a PDF file. The PDF file is stored in the current working folder. By using the JPGToPDFConverter, you are not worry about a big image that can't fit well on the PDF page. For the big image, it is resized automatically to fit the A4 paper size. The process of converting an image to a PDF file in the code above is simple. Firstly, you need to have a BufferedImage object of the original image file. This can be done by using the read method of the ImageIO class. The BufferedImage is resized to fit the A4 paper size if its size is greater than the A4 paper size. This is to make sure that the output PDF file does not contain an image that greater than its size. For the image that is not larger than the A4 paper size, its size remains unchanged. You will need to convert the BufferedImage object back to an Image object since the add method of the Document object of the iText library accepts only the image object ( not the BufferedImage object). This can be done by using the getInstance method of the Image class in iText library. When the image is ready, you can call the add method of the Document object to add the image to the Document object. Thanks for sharing the code i will try it. I am using Aspose.PDF for Java Library for managing my PDF Documents including converting them to image. I will try your code and will see the difference in result. what version of itext library you have used?????? how was the output looks. can u show a sample output. You can give your path to save for "desc" here.